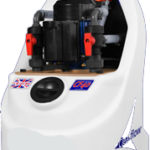 Top of the range Power flushing machine complete with full accessories and training. Fully configured web site with content management system built in. Typical power flushing jobs start from €450 + VAT (current price from Bord Gais Energy) and offer a good revenue stream for both domestic and commercial clients. If you need any further information, please contact 01 687 4853 now!